Title The Bailout Plan: Worst recession ever looms published to cocoa-touch. The fate of the government's $700 billion financial bailout plan was thrown into doubt Monday as the House rejected the controversial measure. The next steps were unclear. The abrupt defeat left the Bush administration and congressional leaders scrambling to figure out whether to renegotiate the bill and introduce it again as soon as Thursday or to try other options. Stock markets reacted violently. Investors who had been counting on the rescue plan's passage sent the Dow Jones industrial average down well over 700 points. The stock gauge closed 778 points lower - nearly 7%. (Full coverage) The measure, which is designed to get battered lending markets working normally again, needed 218 votes for passage. But it came up 13 votes short of that target, with a final vote of 228 to 205 against. Two-thirds of Democrats and one-third of Republicans voted for the measure. President Bush, who earlier in the day said he was confident the bill would pass, said he was "very disappointed" by the House vote. 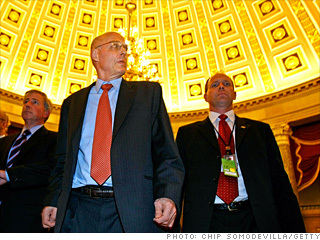 Treasury Secretary Henry Paulson, speaking at the White House, said he will continue to "use all the tools available to protect" the economy. Republican leaders, who had pushed their reluctant members to vote for the bill, pointed the finger for the failure at a speech given Monday by Speaker Nancy Pelosi, D-Calif. Pelosi, speaking on the House floor, had blamed the nation's economic problems on "failed Bush economic policies." House minority leader John Boehner, R-Ohio, said after the vote that passage would have been possible if it had not been for Pelosi's "partisan speech." Rep. Barney Frank, D-Mass., one of the main congressional negotiators, dismissed the GOP claim that Pelosi's speech was responsible for Republicans voting against the bill. "Because somebody hurt their feelings, they decided to hurt the country," Frank said. "That's not plausible." 'Our time has run out' The four-hour debate that preceded Monday's vote included impassioned pleas for and against the measure from Democrats and Republicans alike. Party leaders told members that the only way to protect the economy from a spreading credit crunch was to vote for the difficult-to-swallow measure. "Our time has run out," said Rep. Spencer Bachus, R-Ala., the ranking Republican on the House Financial Services Committee. "We're going make a decision. There are no other choices, no other alternatives." The fate of the government's $700 billion financial bailout plan was thrown into doubt Monday as the House rejected the controversial measure. 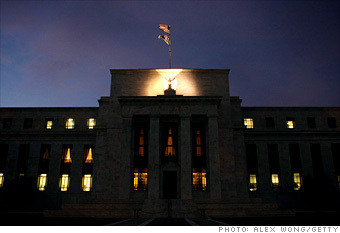 Wall Street was pinning its hopes on the government's $700 billion financial system rescue plan. But the fervently wished-for bailout was rejected Monday by the House of Representatives in a stunning turn of events, and investors reacted with a vengeance. Major U.S. stock indexes plummeted Monday in one of their worst sessions ever. The ugliness was widespread, with major indexes posting their worst percentage declines since the 1987 stock market crash. 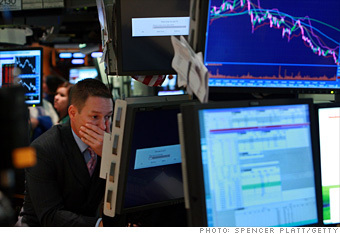 The Dow industrials fell 5.4%, the S&P 500 sank 7.8%, and the Nasdaq plunged a jaw-dropping 9.1%. The Dow suffered its biggest-ever closing loss in point terms: The next steps were unclear. The abrupt defeat left the Bush administration and congressional leaders scrambling to figure out whether to renegotiate the bill and introduce it again as soon as Thursday or to try other options. Stock markets reacted violently. Investors who had been counting on the rescue plan's passage sent the Dow Jones industrial average down well over 700 points. The stock gauge closed 778 points lower - nearly 7%. (Full coverage) The measure, which is designed to get battered lending markets working normally again, needed 218 votes for passage. But it came up 13 votes short of that target, with a final vote of 228 to 205 against. Two-thirds of Democrats and one-third of Republicans voted for the measure. President Bush, who earlier in the day said he was confident the bill would pass, said he was "very disappointed" by the House vote. Treasury Secretary Henry Paulson, speaking at the White House, said he will continue to "use all the tools available to protect" the economy. Republican leaders, who had pushed their reluctant members to vote for the bill, pointed the finger for the failure at a speech given Monday by Speaker Nancy Pelosi, D-Calif. Pelosi, speaking on the House floor, had blamed the nation's economic problems on "failed Bush economic policies." House minority leader John Boehner, R-Ohio, said after the vote that passage would have been possible if it had not been for Pelosi's "partisan speech." Rep. Barney Frank, D-Mass., one of the main congressional negotiators, dismissed the GOP claim that Pelosi's speech was responsible for Republicans voting against the bill. "Because somebody hurt their feelings, they decided to hurt the country," Frank said. "That's not plausible." 'Our time has run out' The four-hour debate that preceded Monday's vote included impassioned pleas for and against the measure from Democrats and Republicans alike. Party leaders told members that the only way to protect the economy from a spreading credit crunch was to vote for the difficult-to-swallow measure. "Our time has run out," said Rep. Spencer Bachus, R-Ala., the ranking Republican on the House Financial Services Committee. "We're going make a decision. There are no other choices, no other alternatives." Added Frank: "Today is the decision day. If we defeat this bill today, it will be a very bad day for the financial sector of the American economy." Boehner told his members, many of whom objected to the measure, that they had to accept something he and many of them found distasteful. "If I didn't think we were on the brink of an economic disaster, it would be the easiest thing to say no to this," Boehner said. But he said lawmakers needed to do what was in the best interest of the country. One lawmaker who voted against the bill, Rep. John Culberson, R-Texas, said the measure would leave a huge burden on taxpayers. "This legislation is giving us a choice between bankrupting our children and bankrupting a few of these big financial institutions on Wall Street that made bad decisions," he said. Culberson voted against the bill. To make the legislation more politically palatable, the bill calls for the government, as an owner of a large number of mortgage securities, to exert influence on loan servicers to modify more troubled loans to help prevent additional foreclosures. The ongoing collapse, bail-out and buy-out of Wall ... Warning that a "long and painful recession" could loom unless the ... there is no alternative to his $700 billion bailout plan. ... Under Pressure From Union Strike Action as Recession Looms ... 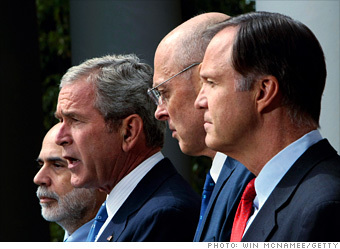 The Paulson Bail-Out Plan is Mortgage Fraud on Historic Scale ... week, labor and management seem as far apart as ever.